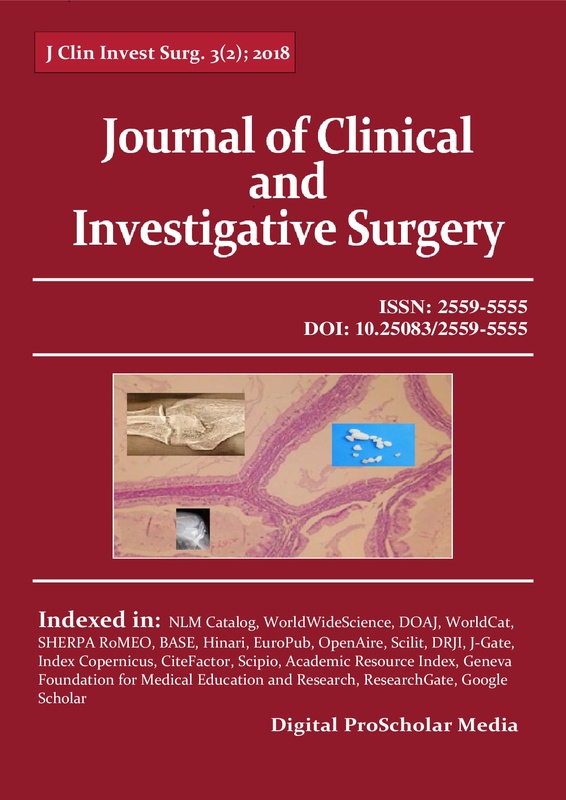 Journal of Clinical and Investigative Surgery takes into consideration a wider range of articles such as reviews, original research articles, case presentations, editorials, letters to the editor. Reviews and specific articles are usually commissioned by the editorial office, but the journal conduct is to analyze any proposal from contributors, too. The journal editor will perform an initial evaluation of each submitted manuscript. All articles are peer reviewed afterwards, prior to acceptance and publication, and some invited articles may ultimately not be accepted for publication. For more information about the journal mission, please see Aims and Scope page. Anyone may submit an original article to be considered for publication in provided he or she owns the copyright to the work being submitted or is authorized by the copyright owner or owners to submit the article. Authors are the initial owners of the copyrights to their works (an exception in the non-academic world to this might exist if the authors have, as a condition of employment, agreed to transfer copyright to their employer). We strongly recommend to all contributors to respect internationally accepted ethical standards related to publications. Contrary, the Editors reserve the right to reject the concerned paper on ethical grounds. Take into consideration the recommendations of the Committee on Publication Ethics (COPE), and Council of Science Editors (CSE). For more details, see: Publication Ethics and Malpractice Statement. Submitted articles cannot have been previously published, nor be forthcoming in an archival journal or book (print or electronic). By submitting material to this journal, the author is stipulating that the material is not currently under review at another journal (electronic or print) and that he or she will not submit the material to another journal (electronic or print) until the completion of the editorial decision process. If you have concerns about the submission terms or procedure, please contact the editors. Journal of Clinical and Investigative Surgery evaluates the quality of submitted papers using the peer review process, an integral part of scientific publishing. Each final response is supervised at least by one of the two editors, based on preliminary editorial evaluation and reviewer’s comments. Any submitted paper undergoes a preliminary editorial evaluation that verifies the minimal requirements. In this stage articles can be rejected due to poor grammar or English language, lack of proper structure (do not provide enough details/ materials and methods to allow other scientists to repeat the study, lack of up-to-date references, etc. ), are outside the aims and scope of the journal or having no new science (does not clearly explain which parts of the findings are new science, versus what was already known). To avoid any delay or rejection due to such reasons, please see Final Manuscript Preparation Guidelines before submission. Authors of manuscripts rejected at this stage will usually be informed within two weeks of receipt. Articles that meet the minimum criteria are normally passed on to at least two expert referees (selected according to their expertise) for reviewing. The referees remain anonymous to the authors, and the identity of the authors is unknown to the reviewers. Referees are asked to evaluate whether the manuscript is original and methodologically adequate (materials and methods, statistical data), has results which are clearly presented and support the conclusions, presents correct and exhaustive references (related to previous relevant work), that contributes to the knowledge and development of the field respecting appropriate ethical guidelines (especially/ but not necessarily limited to plagiarism). Referees advise the Chief Editor, who is responsible for the final decision to accept or reject the article. If decision implies a revision, this must be made by authors according to received comments. Perform/ address all points raised by reviewers and editor, highlighting the changes and additions in the text (with a different color text, or with Microsoft Word’s Track Changes feature). Contrary, provide a scientific rebuttal to points or comments you disagree, describing all these revisions in a response letter. Your revision must be returned within the time period the editor tells you. Journal of Clinical and Investigative Surgery takes into consideration a wider range of articles such as: Editorials, Research articles, Case presentations, Reviews, Letters to the editor, Specific articles. During submission process, authors will be asked to indicate the corresponding category of the article. For general details related to structure and content of the paper, please see the Uniform Requirements for Manuscripts Submitted to Biomedical Journals (ICMJE), and the internationally accepted ethical standards for publication (COPE). In addition, contributors have the possibility to consider the previous published papers and recommendations below, to see how an article is presented according to its category. That the manuscript does not contain texts from previously published materials and that it is not offered simultaneously for consideration/ publication entirely or in part elsewhere, regardless language. That the manuscript is conform with Uniform Requirements for Manuscripts Submitted to Biomedical Journals (ICMJE), and that the paper has been conducted according to internationally accepted ethical standards (COPE). That all authors have read/ approved the final version of the paper. That all authors understood that the full responsibility for all presented data in the article belongs to authors, who are responsible for any conflict of interest (related to subjects included in their work, financial, consultant, institutional and other aspects). If there is no conflict of interest, then it must be explicitly stated. Authors must mention the sources of Funding received for research support and/ or publication of article (either from public/ private entities or contributions from individuals). It is the first page of the paper, and must include: a full title of the article (limited to a maximum 150 characters, including spaces), a short/ running title (limited to a maximum 50 characters, including spaces), the full authors names (first name, middle name, last/ family name) in order that they appear on the article, academic degrees, affiliations (institution, department), and e-mails. The corresponding author must be underlined, including in addition telephone and fax numbers, complete postal address and zip code. It is the second page of the paper, and presents the summary that should be limited to a maximum 1000 characters (including spaces). Abstract must be structured as the main text for original research articles (objective, methods and results, conclusions), or as a standard summary for the other category of articles (original research article, case presentation, etc.). Note that the abstract should not contain abbreviations or reference citations. The second page must contain below abstract: the type of article (review, original research article, etc. ), the word count of the Main text, and up to six key-words. It begins on the third page, being a brief background related to the actual stage of the matter, stating the aims, purposes and the reasons for accomplishing the work. This section contain essential data to facilitate understanding of methodology in the case of research articles (the recruitment criteria of patients, administered treatment, the pursued clinical data, or describing information of the animal lot for experimental studies). The previously published procedures are only cited; essential changes to the previously published procedures are just briefly described, while the new procedure must be disclosed in detail. Statistic methods and laboratory measurements used must also be specified. Results of research articles must be presented with clarity and precision, just describing the findings of the study, presented either in the form of text or illustrated (through tables and figures). Interpretation of results will not be included in Results section because it must be placed within Discussion. It is a section that debates and interprets the results obtained/ presented by research articles (taking into account also the corresponding/ contextual literature data), or continues Introduction expanding it or focusing on specific aspects, depending the article type. New perspectives/ approaches (supported by the study results or by literature data) should be highlighted, while unsubstantiated assertions must be restricted; the study limitations must also be presented. Discussion can be structured on subsections, in order to facilitate understanding. These should usually present the significance and possible implications of the data presented in the Results section (if any) and/ or Discussions. When used in the Main text, they should be limited as much as possible and explained/ expanded after Conclusions. Measurement units should be in accordance with International System of Units (SI). If the case, this refers to those persons who contributed or assisted to the study or manuscript, but who do not met the authorship criteria, or it refers to supporting grants/ projects, etc. Required: Author’s (authors’) name(s), title of work, year (or “n.d.” if no date), and information about how the reader could obtain a copy. Illustrations (figures, pictures) are uploaded as distinct documents during submission process. The file format must be TIFF or jpg to be acceptable. Pictures have to be at least 300 dpi, freehand being unacceptable. Illustrations must be quoted in the text through consecutive numbers (inside of round parentheses), according to order they appear. Each figure and picture should contain title and legend, which allow understanding and interpretation regardless the text. Data presented in Legend should not be repeated in the Main text. Photos from patients can be sent only with their consent and excluding any parts that could lead to subject identification, authors taking a full responsibility for this aspect. Previously published figures and pictures must be accompanied by written permission of the copyright holder that can be used/ reproduced. Tables are uploaded within a distinct Word document during submission process (do not attach the tables as pictures). The table text (size, style) is similar with the Main text. Tables must be Arabic numbered, preceded by a title and succeeded by a legend related to presented data. Table(s) should be self-explanatory, easy to be understood without resort to the Main text content. Data presented in the Table(s) should not repeat in figures or in the Main text. Please ensure that any Table are cited in the text. Please see below details on typesetting and layout requirements pertaining to final manuscript submission to the journal. Write your article in English. Submit your manuscript as a single word document, including tables, figures, appendices, etc. Page size should be 8.5 x 11-inches. All margins (left, right, top and bottom) should be 1.5 inches (3.8 cm), including your tables and figures. Indent all paragraphs except those following a section heading. An indent should be at least 2 em-spaces. Do not insert extra space between paragraphs of text with the exception of long quotations, theorems, propositions, special remarks, etc. These should be set off from the surrounding text by additional space above and below. Don’t “widow” or “orphan” text (i.e., ending a page with the first line of a paragraph or beginning a page with the last line of a paragraph). All text should be left-justified (i.e., flush with the left margin—except where indented). Where possible, it should also be right-justified (i.e., flush with the right margin). “Where possible” refers to the quality of the justification. For example, LaTeX and TeX do an excellent job of justifying text. Word does a reasonable job. But some word processors do a lousy job (e.g., they achieve right justification by inserting too much white space within and between words). We prefer flush right margins. However, it is better to have jagged right margins than to have flush right margins with awkward intra- and inter-word spacing. Make your decision on whichever looks best. All submissions must be in English. Except for common foreign words and phrases, the use of foreign words and phrases should be avoided. Authors should use proper, standard English grammar. The Elements of Style by William Strunk, Jr. and E. B. White (now in its fourth edition) is the “standard” guide, but other excellent guides (e.g., The Chicago Manual of Style, University of Chicago Press) exist as well. Because this journal publishes electronically, page limits are not as relevant as they are in the world of print publications. We are happy, therefore, to let authors take advantage of this greater “bandwidth” to include material that they might otherwise have to cut to get into a print journal. This said, authors should exercise some discretion with respect to length. Submit your contribution online reading Instructions for Authors- Submit Online section. Authors who are unable to submit their manuscript due to technical problems should contact the Editorial Office. We intend to give quick and reasoned answers to all submitted papers. All manuscripts will be reviewed by the Editor(s), by members of the Scientific Council, or other external reviewers. The final decision will rests to one of the two editors, based on preliminary editorial evaluation (journal profile, compliance with the previous mentioned requirements), on peer-review recommendations, originality of the manuscript, the quality of the work and clarity of the presentation, and editorial priorities (each paper will be evaluated taking into account not only the previous published papers but also other concomitant submissions that are under consideration at that time). Counterarguments to rejected manuscripts and resubmission of rejected manuscripts are generally omitted. All authors are responsible for the content of the article submitted and other conflicts of interest related to study participants. Authors have also to specify any financial implications regarding the study and manuscript. Once a manuscript has been accepted for publication the corresponding author of the paper will receive an e-mail requiring to complete, sign and send the Conflicts of Interest Disclosure Form. This form is mandatory for publication; even accepted for publication, the paper will not be posted in the journal until Conflicts of Interest Disclosure Form will be received. After receiving of the two forms, a PDF copy (Proof) of the article will be sent to the corresponding author for a final revision. Only minor corrections to the manuscript are acceptable at this stage, no significant changes being allowed. The Proof must be checked carefully and sent back (incorporating corrections, if the case) to the journal within three working days from reception. Order in which each accepted article is posted in the journal depends by date of submission, date of acceptance, compliance with journal profile, peer-review recommendations and editorial priorities. Users of the website and/or software agree not to misuse the service or software in any way. The failure of to exercise or enforce any right or provision in the policies or the Submission Agreement does not constitute a waiver of such right or provision. If any term of the Submission Agreement or these policies is found to be invalid, the parties nevertheless agree that the court should endeavor to give effect to the parties’ intentions as reflected in the provision, and the other provisions of the Submission Agreement and these policies remain in full force and effect. These policies and the Submission Agreement constitute the entire agreement between and the Author(s) regarding submission of the Article. Although can provide limited technical support, it is ultimately the responsibility of the author to produce an electronic version of the article as a high-quality Word or RTF file that can be converted to a PDF file. It is understood that the current state of technology of Adobe’s Portable Document Format (PDF) is such that there are no, and can be no, guarantees that documents in PDF will work perfectly with all possible hardware and software configurations that readers may have.